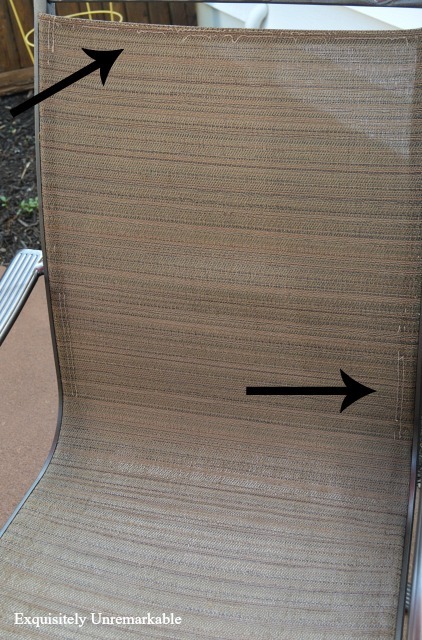 Dirty and torn fabric slings on your outdoor chairs? Here's how to replace them. Ah...summer. It's the season I wait for all year long. I am a true summer girl and I try to hold on to every second of it. I adore the warm air that hits me in the morning when I open the patio door, the smell of the salt air, the late sunsets and the sand between my toes. I am outside as much as possible. So it stands to reason that in the summer, I suddenly don't really care about the interior of my home that much. Decor decisions that seemed so pressing a mere month ago have fallen away. I can't even remember what I was stewing about now that the great outdoors calls. Instead, I begin decorating and fluffing so my view outside is as pretty as the one inside. However, just like inside, nothing has really been done outside in the past decade or so. Yes, yes, we did enclose our covered porch and my husband did stain the patio. But other than that, the backyard has not changed in years. 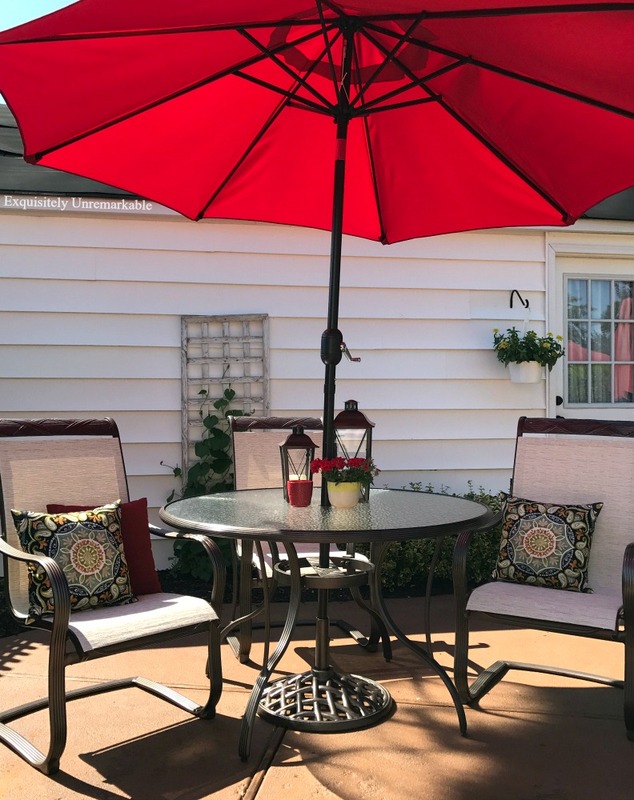 I have had the same furniture, the same umbrellas, the same planters and yard decor. And this year, I was bored silly with all of it. Of course, it helped that much of it is worn and needed to be replaced. Tossing perfectly good items for the sake of whimsy doesn't really bode well with this waste not, want not girl. So my husband and I decided to DIY. ...and left everything in the garage, untouched, for about three years. That brings us to this summer. 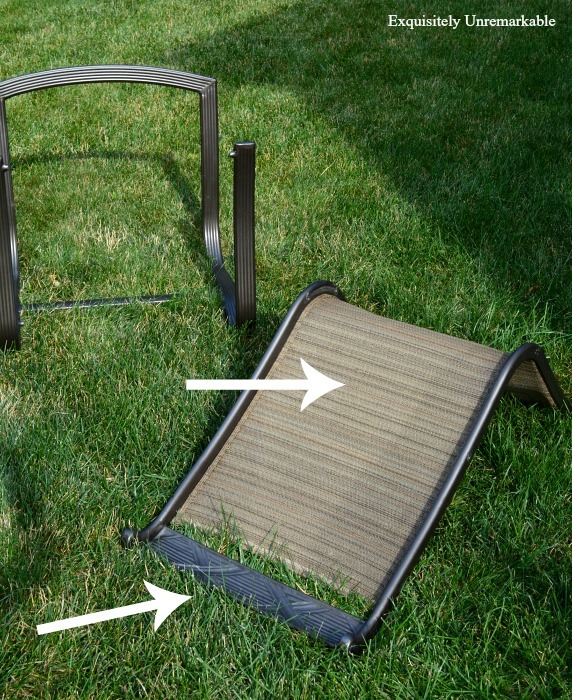 After more than a decade, our old aluminum patio set had started to chip and the slings were getting ragged, faded and had worn thin. We looked for a replacement for years without any luck. 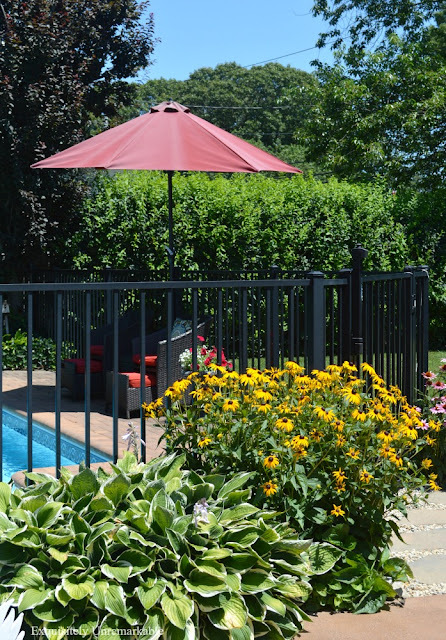 Aluminum sets do not rust and are perfect for the beach and pool lifestyle, but man, are they pricey. And while I would love to have one of those fabulous sets you see in the PB catalogs, it's just not practical for our lifestyle. We need chairs that will dry quickly since most people have wet suits and the idea of covering or removing cushions each night was never going to happen. That's when we remembered the chairs in the garage and decided to do the entire set over. Here's where we started. First things first, we chose a paint that was safe for metal and didn't need a primer. Then we just picked a color ~ something classic ~ and bought 8 cans for about $6 a pop. Next, I ordered slings. Since so much time had passed from the date of our original order, the fabric we chose for the sliders had been discontinued. I looked all over the internet for inspiration and something that would coordinate, since I didn't want to reorder those slings, too. I gathered samples, because computer monitors are not reliable. The color displayed on your end, may not be the color displayed on theirs. I chose a very light sling in a fabric called Natura. Most important step in this process? Measure, measure and measure again. Read the instructions on the website for how to measure for your specific piece of furniture. Slings come in one piece or two, depending on your chair or chaise. 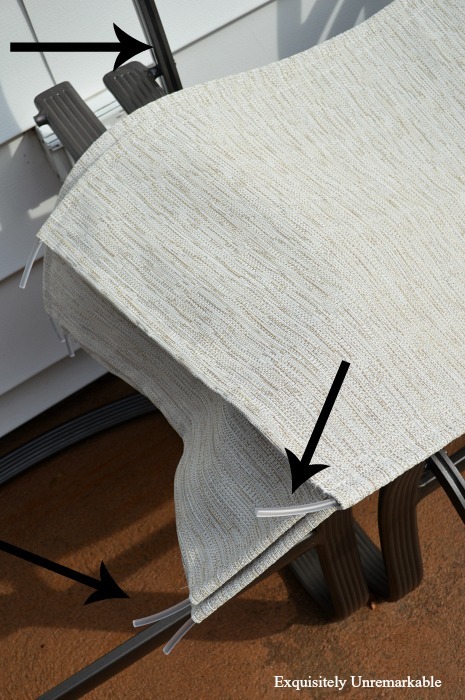 When in doubt call and ask for help, the fabric must fit perfectly or your chair will not hold up. Once everything was ordered, my husband took the chairs apart and spray painted them along with the table and umbrella stand. This was how everything looked before...ick. They sat like that, for almost a month. The replacement slings are custom made and summer is the high season. Lucky for us, June was cold and rainy. When they finally arrived a few days before July 4th, they brought the warmth and sun with them. I think it's because they came from Florida. Now. Taking the chairs apart was not hard. Note: This one chair was reassembled after painting because we needed a place to sit for a few weeks while we were waiting for the new slings to arrive. That's why it's shiny. My husband just literally unscrewed anything that was holding the chair together. He stared with a wrench, but soon realized a drill would make it easier. Once the seat was separated from the frame, he used a razor to slit the seat down the middle. Then he removed the top bar and the plugs that secured the spline to shimmy it out of the channel. Putting them back together was a bear. There are a lot of tutorials online about ways to do it and tips to make it easier. Supposedly there is a tool you can buy, but we just did it the old fashioned way with a lot of sweat and strength. The slings come with a new plastic spline that needs to be fed into the channel in the chair. There were some recommendations to oil the channel, but my husband did not want to get oil all over the slings and he didn't want it to stain my light fabric. Instead, he applied a little cooking spray to a q-tip and ran that up and down the channel. We fed one side in at a time, turning and twisting the metal bar with the channel as we fed the spline through. That's the hard part. It doesn't go in easily and you want the fabric to be taught so you need to stretch and pull it all the way to the end. 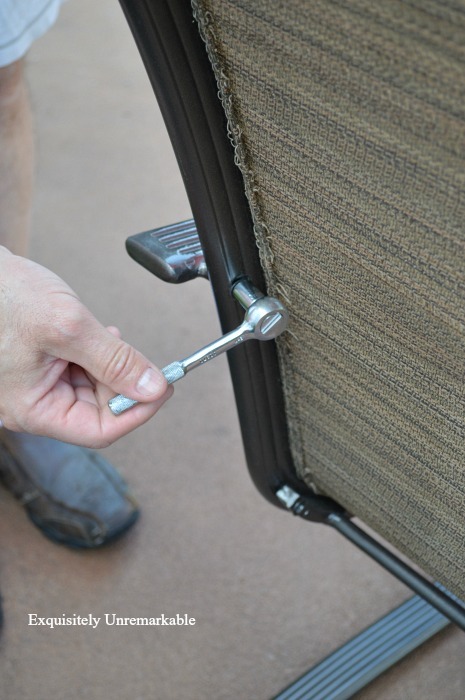 Once it's in, you just need to gather all your pieces and screws and reassemble the chair. Then clip any of the excess spline and put the plugs back in. When we started this process, I was excited, but also a little bummed out at the prospect of being stuck with the same old, boring patio set for another decade. However, now that it's done, I absolutely love it. The lighter slings, darker paint and addition of a few new colorful pillows and umbrella has breathed new lift into the old set. It's still super practical for our needs and didn't cost a lot. Plus, now I have six chairs and unified set. The four slings were just under $40 each. Although there was a huge variation in price from company to company. 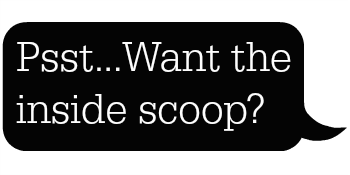 I paid $50 each for the first two and got quotes of up to $100 each, so shop around. We chose the least expensive company this time and their work was lovely ~ exactly the same as the $50 ones. So there you have it. 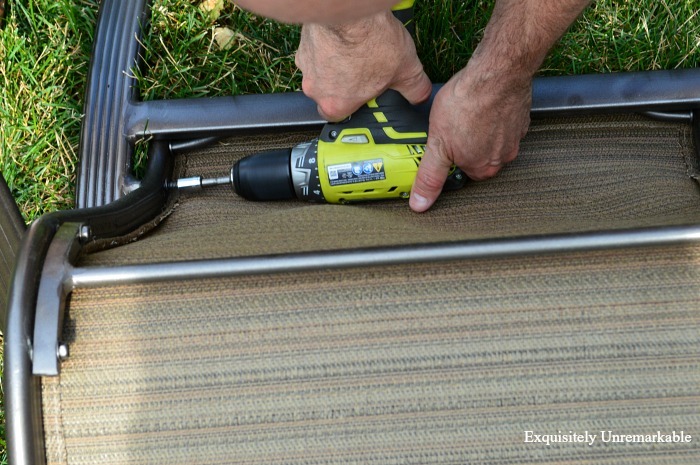 How to replace outdoor patio furniture slings to update an old set. Definitely not a super easy DIY, but certainly doable and much, much less expensive than buying new. It looks like a brand new set Kim. The dark metal paired with the light sling makes it look so pretty. And of course the addition of the pillows gives it a fun look. Smart thinking to order the slings. Thank you so much, Mary! I did not have a lot of faith in the process, but in the end, I was wowed. It's a lovely place to sit now and I don't see anything in a catalog that I like better and certainly not for the price! Oh Kim this is so awesome. I love the spray paint you used on the frames and the sling material is gorgeous. You got a whole new set for just some elbow grease. Wow I love this!!! Probably one of the best summer outdoor furniture make overs I have seen. You don't need no stinkin Pottery Barn! Beautiful job. Hi Kim, This makeover is really fabulous. I have used that same spray and color for several of my outdoor pieces too. It wears like iron!! The sling fabric you chose is beautiful too and a nice contrast. Beautiful job and it looks brand new!! Love the pillows you added. I must say, "it looks fantastic!" 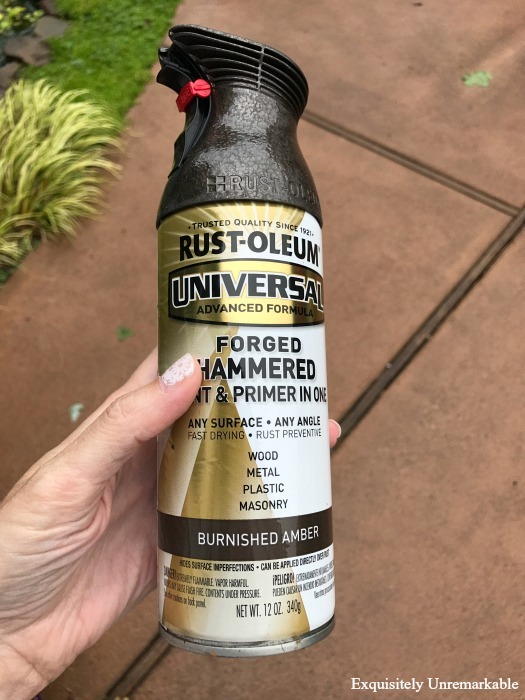 Love the hammered aluminum spray you chose to paint them with. You made it sound easy changing out those slings! Now you can enjoy them a good long while! 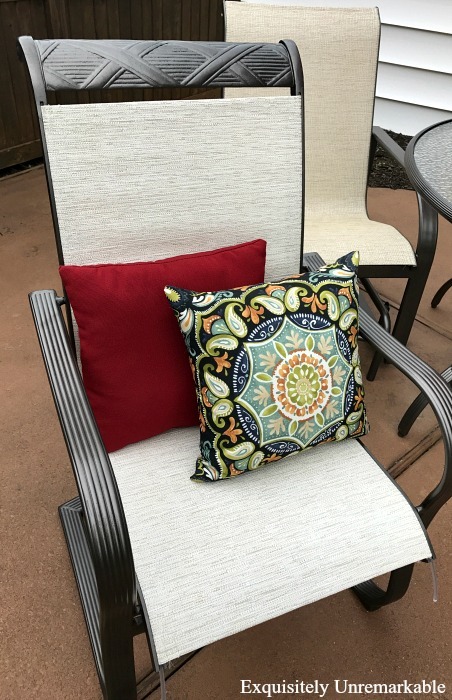 I remember one year I sewed my own new patio cushions for some porch chairs we had, but it was a bear trying to sew Sunbrella fabric with my sewing machine. I did it though. Thanks Florence! My husband actually asked me if I could sew the slings myself and I said, "Um, no way!!". I give you a ton of credit for sewing your own cushions. That is a huge accomplishment! Beautiful job! Looks quite professional. Always is a great feeling to complete a project especially when it looks as nice as this! Happy weekend! Thanks Lynn. Yes, I was pleasantly surprised by how much I love the "new" set. I was not at all surprised by the professional result. My husband is quite talented and a perfectionist!! That's a lot of work, but they look great! Enjoy! Thanks Deanna! So glad it's done. These turned out beautifully and look so sophisticated. 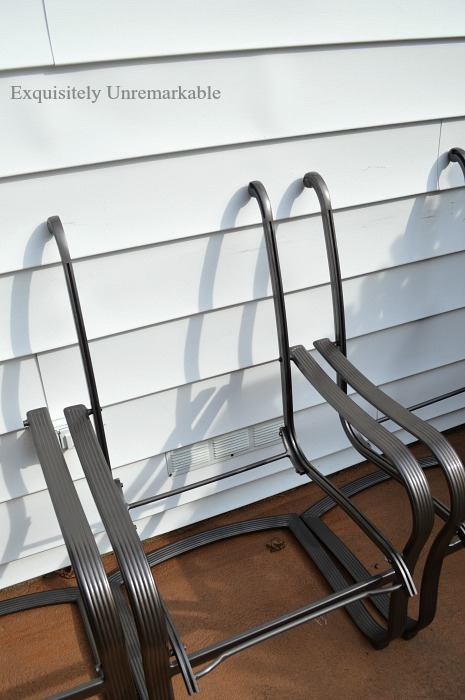 We have some sling chairs that are discolored from the sun. I will be looking into replacements. Oh great Toni! I am glad that you have found some inspiration today! Wow- That was a big job to take on. Don't think my unhandy hubby could BEGIN the project-let alone finish it and not sure I am ambitious enough to attempt it on my own. It sure looks great now that you are done though. Absolutely perfect!!! Wow, so much work! To have your hubby in on this project for the long haul is quite a blessing. The whole set looks great! Thanks AnnMarie, he definitely has that can do attitude. Halfway through, before we ordered the slings, we did shop a bit, but we couldn't find anything so we trudged forward. Just glad it's done now!! The makeover looks great. I can see why you would want to keep this set. The detailing is very pretty. Thank you, Debbie. Truth is for what they wanted for a new set, it wouldn't have been that much different and since we did like the detail, we decided a do over was best. Thanks for the visit and the comment. I hope you pop by again! These look amazing. And even with the cost of supplies, if the bones of the chairs are in good shape, I know it's more cost efficient than new. Where did you order the slings? I couldn't find anything in the BLOG, maybe I missed it. Thanks, and again, beautiful job. Hi Brenda, thanks for the kind words! And yes, definitely more cost efficient than new in our case. I ordered the last set of slings from a company called Patio Direct Online. Before that I ordered from Over and Under Online. I was very happy with the quality of both. Good luck! Passing this on to my daughter. Your "sling" chair look like hers. Not sure they will want to endure the "redo" with patience though! Very nice looking "new set!" I wouldn’t blame them! If I had a steel set or did not need a quick drying seat due to wet pool and beach bottoms, I’m not sure I would’ve done this, Lynne. It was time consuming. However, since we paid over $700 for this set over a decade ago, something comparable in quality and style was in the thousands now, so it was worth it for us. Especially since summer is a relatively short season in my neck of the woods. Boo. 😉 Thank you for your sweet comment! I envy anyone who lives in a place where it's actually tolerable to spend time outdoors. That isn't the case here. Summer is short here, Brenda, but generally tolerable. There are 100 degree humid days, but that’s the exception not the rule. Of course, the trade off is that fact that we often spend December to April buried in snow and with temps that don’t climb above 20. Wow, they all look like brand new pieces....good job! Oh my, you guys did a great job! And cooking spray to the rescue! Good tip there! You're so right about ordering samples. I've ordered things that turn out totally different than how they displayed on the screen. And I totally agree to shop around...with everything. I was at the store the other day and needed an eyebrow brush. The first one I saw was $19! What?! I kept looking and found one for $7, but didn't stop until I came across the e.l.f. ones that were only $1. Score! Lol! Samples were key, Lisa. The first set we ordered, for those two sliders, were supposed to match the old set. They were so much lighter, not even close. Lesson learned! And way to score in the make up aisle! I love e.l.f. Their products are great and the prices are awesome. I am passing this along to my friend Bonita, who has chairs like this and she needs to add some TLC to them. I wish I knew about this years ago as I have chairs that needed new slings. I put them to the curb. But now i know better. Great post. I had no idea either, Debra. My husband suggested it and then we just fell down the Google rabbit hole looking for solutions. Thanks for coming by today!! Great job! Everything looks fabulous!! What a great tutorial and your set looks perfect. Congrats to you and your husband for a job well done. Now, while I knew this was going to be about chairs, I cracked up at " But other than that, the backyard has not changed in years"
Wonderful job on this!! They look like brand new chairs! Thanks so much, Deb! And yes, we have the requisite repairs, but as far as the decor goes, I'm a pretty boring girl! They look awesome...like a brand new set! Love the dark paint color with the light slings. 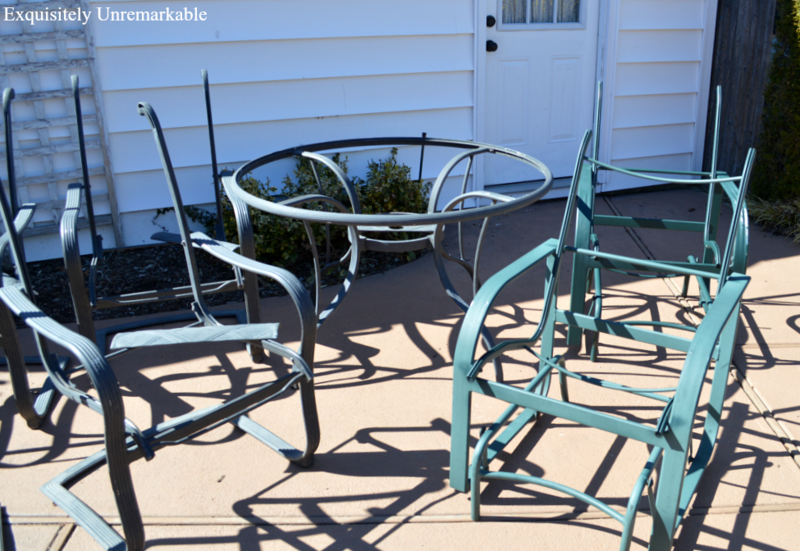 The transformation of your patio set is beautiful. Your hard work paid off and I love that it was curbside. Thanks so much Sherry, yes, those curbside rescues gave us the motivation to redo our old set. It was the push we needed for sure! Would you believe I NEVER find curbside treasures in my area? 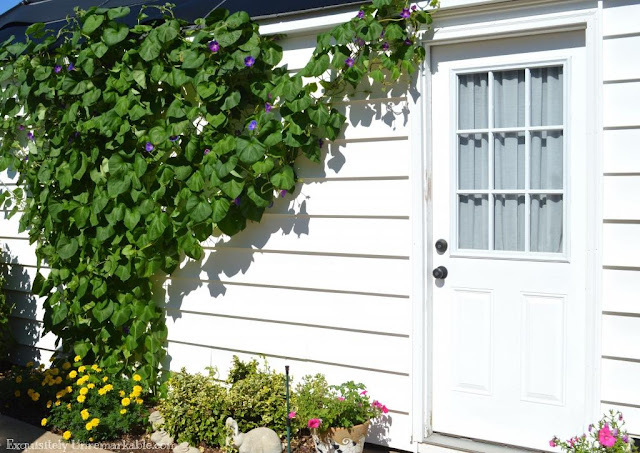 Love your outdoor space and DIY upcycles! That metallic paint is great and so versatile. We have a lot of good garbage around here, Cecilia! I’m not exactly sure what that says about my neighborhood!! Ha! Exactly, Donnamae! It was totally worth it. Good luck on your project. Please let me know if you do it, I would love to see pictures!! It was quite a job, Marilyn, but I love our new set, too!! Thanks so much! Those look great! 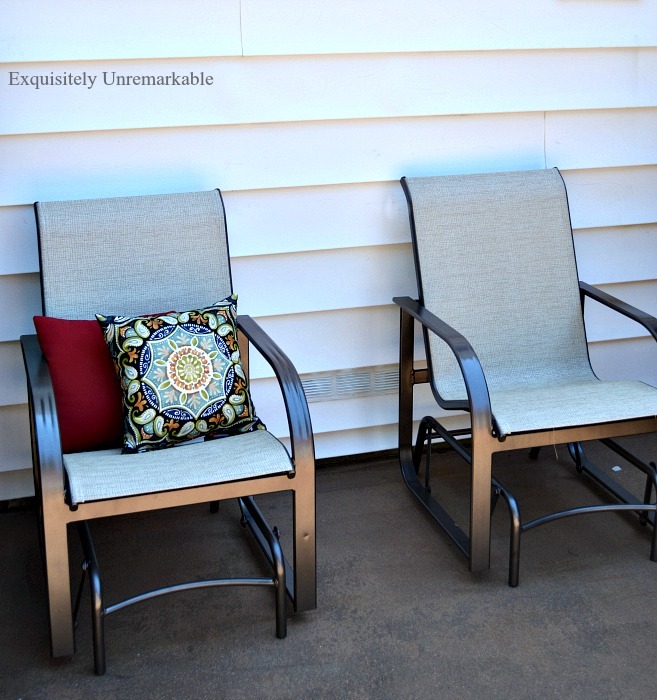 We have similar outdoor furniture and your tips for repairing them are super helpful. Thanks Elizabeth. We are very happy with the outcome. I appreciate the visit and the comment. I hope you visit again, soon. It's very beautiful! 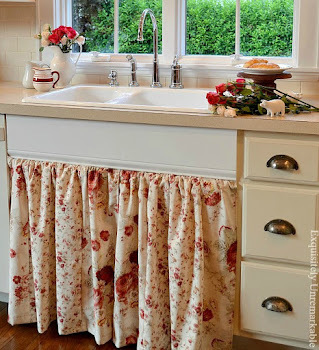 It must bring you both much contentment to be finished with this project and I think your husband must be a very patient person - at least with stuff in order to take on and complete a project like this. It is amazing what you both can do together! He is very patient and had a definite can do spirit! :) Thanks so much, Ronda! I love your spirit, Kim! You should be proud of your makeover... it definitely looks like a brand new set! I do have to say that I was surprised at the price of the slings. Seriously I would have thought $25 a piece. Still much less than the $$$ for a new chair. Isn't it great that red is still a color that can be found in umbrellas? You are a blessed gal! Great job Kim! Isn't it amazing what new spray paint can do? hanks for sharing with SYC.